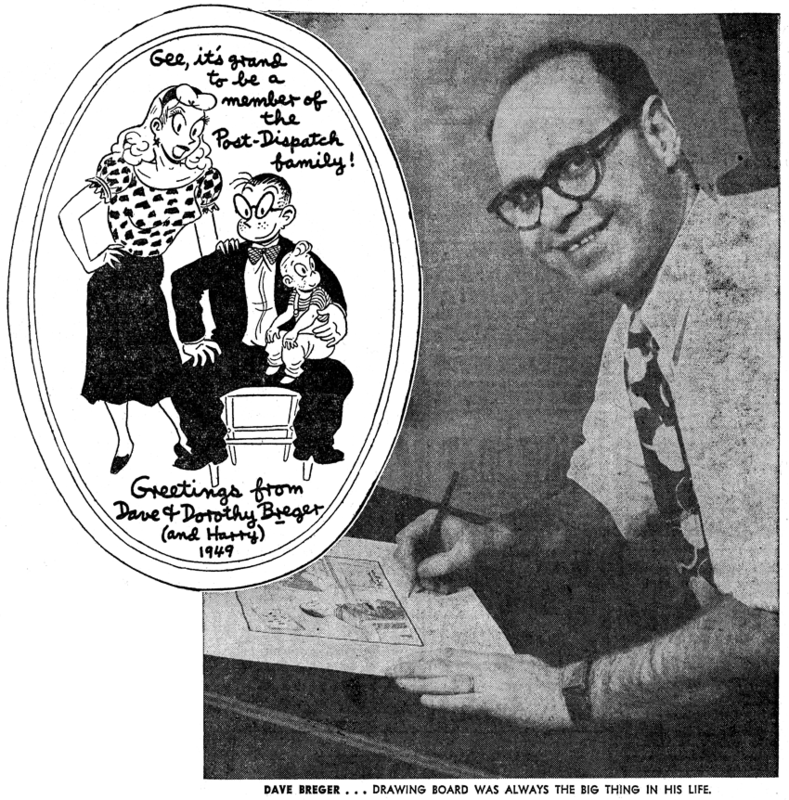 West Nyack, N. Y., Feb. 8 1949 -- Despite the seeming quandary in which the Mr. Breger of the comic page continually finds himself, his creator, cartoonist Dave Breger, is a singularly determined and purposeful man. For instance, as a boy Dave was pushed into the family sausage business by his father. Dave escaped. He wanted to be a cartoonist. In school, his professors tried to make a psychologist of him. He held out for a drawing board. And in the Army, a classification expert tried his level best to make Dave a truck driver. The Army lost. Private Breger became, of course, a cartoonist. Today "Mr. Breger," which appears in both the daily and Sunday comic pages of the Post-Dispatch, nets Dave a nice living of four-days-a-week work. "I draw 'Mr. Breger' and even wrap and mail it myself to my New York syndicate in four days and have three days left out of every week for my wife and kids," says Dave. "Can you imagine a psychologist or a sausage salesman earning a living that easily?" When Dave was drafted into the Army in September of 1941, he was already a professional cartoonist, but Army classification experts thought they needed auto mechanics more than cartoonists, so he took his basic training in truck repairing and had to pretend to like it. But Breger kept drawing. "I was," says Dave, "getting $21 a month from Uncle Sam for driving a truck and ninety bucks a week for my cartoons in the Saturday Evening Post." It wasn't long before Army brass tumbled to the idea that Uncle Sam had a soldier down in Camp Livingston, La., who was drawing these cartoons for the Saturday Evening Post and they thought it might be a good idea if this Breger boy also drew for the Army magazine, Yank. In the Saturday Evening Post and in his syndicated newspaper work, Dave had been calling his oval-faced little ineffectual soldier cartoon character, "Private Breger." Now he was looking for a new name for the poor little army misfit when the guy began appearing in Yank. Home on furlough, he yelled to his wife one morning while he was shaving in the bathroom, "How about G.I. Joe?" "What," his wife called back, "does G.I. mean?" Breger went on shaving and thinking and the next day suggested the name to the feature editor of Yank. The editor wasn't any brighter than Breger's wife. "What," he wanted to know, "does G.I. mean?" Breger patiently explained and when the first issue of Yank made its appearance June 17, 1942, there was "Private Breger," already known to newspaper comic readers. But now in Yank he was called G. I. Joe. The term caught the fancy of the United States Army and civilian wartime public like a tornado takes off with an Arkansas hencoop. What the doughboy meant in World War I, G. I. Joe stood for in the last war. Even the movie boys seized happily on it for the Ernie Pyle film, "G.I. Joe." After four years and some odd months in Uncle Sam's service, during which time he rose from buck private to first lieutenant, Breger came back home to settle down here in West Nyack. He also got Private Breger of the comics out of the Army and under the name of Mr. Breger continued his doings in the daily and Sunday funnies. Today Mr. Breger is carried in more than 100 papers throughout the United States. Breger has done a lot of things in life, but, as already indicated, the only thing he ever really wanted to do was draw. Born only six weeks after his parents arrived in the United States from Russia, Dave spent his childhood in Chicago. His father had developed a flourishing sausage business there and Dave wasn't a bad salesman. But the only thing he remembers with any pride about that sausage interlude in his life was that he thought up a slogan for the family business— "Our Wurst Is The Best." As for education, he "had enough." He went to a technical high school and drew some comics for the school paper. He attended the University of Illinois, studied architectural engineering for a while and then transferred to Northwestern, where he took a pre-medical course. Then he changed to psychology and got, his degree in that in 1931. But he still had the cartoon bee in his bonnet, and so with money advanced by his father, he traveled around the world for a year— peddling an occasional cartoon to the German magazine, "Lustige-blaetter." Then in 1937 he went to New York where he slowly began to work his way into the cartooning field. He had made a pretty good start when Uncle Sam decided his services were needed in 1941. After being promoted to drawing "G.I. Joe" for the Army magazine, Yank, Dave was sent to England. He didn't mind doing his duty, but he hated to leave his brand-new bride. The next time he saw her he also had a daughter a year old. "I'll never forget the afternoon I called her up to tell her I was going," Breger says. "You know what she said before I could say a word? She said, 'Don't tell ma you're going to be late for dinner again!' I was late, all right. Two years late." Breger stands five feet eleven and weighs 190 pounds. "I made Mr. Breger a little undersized runt to compensate for my superiority complex," he explains with a grin. He is strictly a homebody, and does not smoke or drink. He thinks he has the three finest children in the world. His oldest daughter, Dee, is now six years old. His second child, Lois, is four and his baby, Harry, is nine months. "I started putting Harry in the strip without thinking whether the other kids would mind it," he eays. "But as it turned out I didn't hurt their feelings at all. Now they grab the paper and when I've got Harry in a cartoon they hold it in front of his face and say, 'Look Harry, here's your picture.'" Breger has published four books. The first was "Private Breger"; then came "Private Breger's War"; the third, "Private Breger in England"; and the fourth, "G.I. Joe." Two things happened to Breger during this war that he'll never forget—aside from that first year in the Army as nursemaid to a two-ton truck. The first was an experience he had one time when in the course of his cartooning duties abroad he had occasion to call on a major general. Breger was then a sergeant and the general turned to his chief of staff, a colonel, and said, "Colonel, See this guy? He's making more money than both of us put together." Breger's second fondest remembrance is of a man he knew in his original company down in Louisiana. The soldier was a concert pianist but the Army also put him on a truck. Somewhere in England Breger met the guy again. They exchanged the time of day and Breger proudly announced, "I ain't driving trucks any more. I'm drawing cartoons." The guy looked at him sadly and replied, "I ain't driving trucks any more either. I'm repairing them." Thanks to Cole Johnson, who supplied a scan of this clipping from the St. Louis Post-Dispatch. This is part 2 of a 5 part series that they ran in 1949. We will be presenting all 5 episodes in upcoming posts.